Aunt May's home has turned into a boarding house for homeless superheroes in hiding. After taking in Johnny Storm and introducing him to Peter's high school as a distant cousin, the family's turned the exact same trick again, this time with Iceman Bobby Drake. Sounds a bit conspicuous, right? 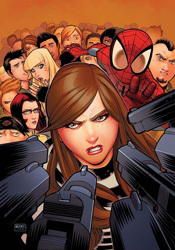 Well, don't forget to factor in the rising public distrust of mutants, Kitty Pryde's public life as just such an individual, and the arrival of a large group of federal agents who would like to share a few words with her. Suddenly a pair of vaguely familiar new students with dyed hair doesn't seem like such a big deal. Make no question about it: this series has changed decidedly since Ultimatum. Not just in terms of its cast, which has shifted noticeably from a solo book with irregular guest spots into a full-fledged monthly team-up series. Not just in subject, flip flopping from a superhero book with a side of relationship drama into an after-school special with a dash of superheroics thrown in for flavor. It's also completely changed its tone. What used to be a genuinely exciting series with a good sense of humor, tight drama and great action, appropriate and enjoyable for all ages, now feels more like a girl's manga digest. Brian Michael Bendis still shows flashes of what made him one of my favorite writers when this series was running under its original title, but he pairs that with the willingness to linger and lost maturity that's turned me off to him lately. This is a series that I used to identify with, one that I think universally connected with anyone who had trouble communicating with their peers in high school. Lately, it's only served to remind me why I don't hang out with kids that age today. David Lafuente's artwork is horribly frustrating to cope with, particularly after Mark Bagley and Stuart Immonen's long, sustained preceding runs. Lafuente's layouts, far and away his greatest strength, improve every month. He tells a fantastic story in between the panels and shows top-notch pacing throughout this issue. It's incredibly easy to read, and a quick scan tells the whole story without sacrificing any emotion. His actual renderings, on the other hand, have faded just as quickly as his storytelling has improved. As Lafuente streamlines and simplifies his already-bare pencils, the artwork itself begins to feel incomplete and terribly, excruciatingly rushed. His grip on the characters, which was extremely loose to begin with, has all but come undone at this point. After ten issues, you'd think he'd have a pretty good idea of who the cast is and what they look like, but I still found myself citing the word balloons to see which face in the crowd belonged to Peter Parker. Lafuente's foundation is solid, but his execution gets worse with each issue. It's a shame what this series has become. Where previously it stood apart from the pack, an example of what made comics great in their heyday, today it merely reinforces some of the most glaring flaws about the modern mainstream. It's meekly written and amateurly illustrated, but it absolutely meets its deadline every single month. Skip it. Apart from a brief flashback moment provided by the school principal, of all people, this series is going nowhere I'm interested in visiting.